After spending 11 hours combing 700 square miles off the coast, the U.S. Coast Guard has suspended the search for a crew member who fell off a crabbing boat in a tragic start to the commercial Dungeness season. Moore fell off the 47-foot commercial vessel Chief Joseph around 1:10 a.m. on Sunday along with another crew member, whom the captain was able to pull back on board. Moore has not been found. The Coast Guard MH-65 Dolphin helicopter crew from Air Station Humboldt Bay arrived at the scene 8 miles off the South Spit about 40 minutes later, followed by a 47-foot lifeboat crew from Humboldt and a C-27 Spartan fixed-wing aircraft crew from Air Station Sacramento. The three crews traversed a 700-square-mile area looking for any sign of Moore before the search was suspended 11 hours later, Coast Guard Petty Officer Third Class Sarah Wilson said, noting “the case is only suspended, not closed” and the search would resume if they received new information. According to the United States Search and Rescue Task Force, the expected survival time for the 52-degree water conditions at the time is between one and six hours. The search was the second crab fishing-related emergency the Coast Guard responded to this weekend after earlier in the day receiving reports of a fishing crew in distress. Three crew members were donning life jackets and preparing to abandon the Gerry B when crews arrived around 10 a.m. Saturday. The vessel was taking on water about 8 miles south of the Humboldt Bay jetties and had no electrical power or communications when a helicopter crew was able to drop down a radio while helping guide the Coast Guard lifeboat through a fog bank to the rescue. After pumping equipment was brought on board to stabilize the ship, the Gerry B was escorted back to Woodley Island. “Thanks to the help of a good Samaritan, our crews were able to assist these fishermen by air and by sea,” Fuller said in a separate release. “Other boaters can be the eyes and ears of the Coast Guard, so it’s great to see the fishing community look out for each other." Wilson said noted that “safety of life at sea” is the bottom line for the Coast Guard and there are resources available at www.fishsafewest.info and www.uscgboating.org. “Two search and rescues in two days of crab fishing is alarming for us, to say the least,” the Coast Guard spokesperson said. Two crewmembers aboard the Chief Joseph reportedly fell overboard while attending to crab pots around 1:10 a.m. The vessel captain was able to pull one person back aboard but could not see the other fisherman. The man who was retrieved had no reported injuries. MCKINLEYVILLE, Calif. — The Coast Guard aided three fishermen in distress after the engine room on their vessel began flooding near Humboldt Bay, Saturday. 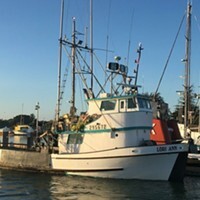 A good Samaritan issued a mayday Coast Guard Sector Humboldt Bay watchstanders via VHF-FM channel 16 around 10 a.m., reporting that the commercial fishing vessel Gerry B was taking on water and had no electrical power or communications eight miles south of the Humboldt jetties. The fishermen were reportedly donning life jackets and preparing to abandon ship. A Coast Guard Air Station Humboldt Bay MH-65 Dolphin helicopter crew was airborne on a training flight in the area and diverted to the scene. A Coast Guard Station Humboldt Bay 47-foot Motor Lifeboat crew also launched in response. The Dolphin crew located the vessel and lowered a radio to establish communications. The crew then circled overhead and helped direct the Motor Lifeboat crew to the vessel through a fog bank. The boat crew delivered a dewatering pump and transferred Coast Guard crewmembers onto the Gerry B to help dewater the vessel. Once the flooding was controlled, the Motor Lifeboat crew escorted the Gerry B to Woodley Island Marina in Eureka. 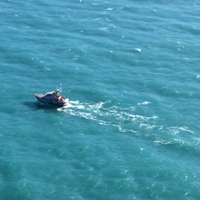 “Thanks to the help of a good Samaritan, our crews were able to assist these fishermen by air and by sea,” said Capt. Greg Fuller, the Sector Humboldt Bay commander. “Other boaters can be the eyes and ears of the Coast Guard, so it’s great to see the fishing community look out for each other." 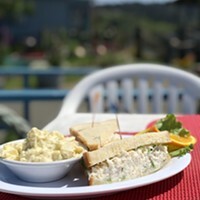 The crew of the Gerry B was reportedly Dungeness crab fishing at the time of emergency. The Coast Guard reminds commercial fishermen to ensure they have all appropriate lifesaving equipment aboard prior to getting underway. Safety requirements can be found at www.fishsafewest.info. For a list of additional safety suggestions, visit www.uscgboating.org.